A SECTION of the world’s biggest scientific experiment – the Large Hadron Collider (LHC) – will be part of an interactive exhibition at Edinburgh’s Dynamic Earth starting Friday 31 July. 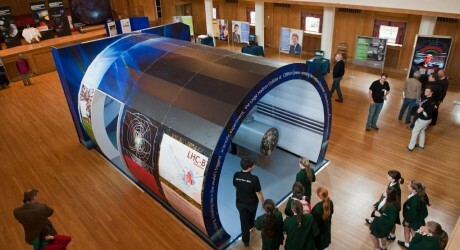 A life-sized mock up of part of the 27-kilometre particle accelerator will be on display at the attraction until 24 August – one stop on a national roadshow that celebrates the UK’s involvement in the groundbreaking discoveries made by the LHC. The exhibition, which has been created and loaned by the Science and Technology Facilities Council (STFC), will feature a 6m long x 2.8m wide ‘walk through’ section of the LHC tunnel and accelerator. This is the machine that confirmed the existence of the Higgs Boson particle – proposed by University of Edinburgh professor, Peter Higgs, who shared the Nobel Prize in Physics for the discovery with François Englert in 2013. Hermione Cockburn, scientific director at Dynamic Earth, said: “The CERN Hadron Collider is pushing the boundaries of scientific discovery, and changing what we know about the composition of our Universe. Eilidh Massie, marketing manager at Dynamic Earth, adds: “Alongside this impressive machine section, there will also be iconic and stunning images from the world of science, and a host of interactive exhibits. The Large Hadron Collider is the world’s most powerful particle accelerator, based at the CERN headquarters in Geneva. It is a 27-kilometre circular circuit that uses magnets to speed up particles travelling in opposite directions to almost the speed of light, before making them collide. The exhibition is part of an updated roadshow from the STFC, following a two-year upgrade at CERN which will see the power of the LHC almost doubled. The display features new interactive exhibits and redesigned tunnel artwork highlighting what scientists hope to learn in the next phase of working on the world’s biggest scientific experiment. Access to the exhibition is free with admission to Dynamic Earth. For more information on events and activities happening at Our Dynamic Earth, visit www.dynamicearth.co.uk. Dynamic Earth, Holyrood Road, Edinburgh, EH8 8AS. Tel: 0131 550 7800 dynamicearth.co.uk. Our Dynamic Earth is the only visitor attraction in the UK solely dedicated to the story of Planet Earth. CERN (Conseil Européen pour la Recherche Nucléaire) is theEuropean Organisation for Nuclear Research. MEDIA RELEASE issued by Pagoda PR. You too can post your story ideas for journalists (aka press or media releases), on allmediascotland.com. Email here for more information. Check out too twitter.com/allEdinburghPR. And twitter.com/allSciencePR.